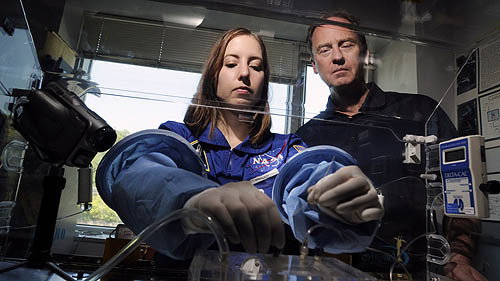 Jennifer Hayden and James Burgess work with the Aqueous Immersion Surgical System prototype prior to an upcoming parabolic flight test (Credits: Bill Wade/ Pittsburgh Post-Gazette). The longer a space mission lasts and the further it travels from Earth, the more prepared its crew must be to deal with medical emergencies on its own. That was on the minds of a group of researchers composed of medical doctors and engineers as they considered taking their Aqueous Immersion Surgical System to space. The system is composed of a clear dome that can be placed in watertight contact with skin, enclosing the wounded area. The dome is filled with a sterile saline solution with controllable pressure. Watertight ports are used to introduce instruments into the dome and gloved armports allow the operator to apply them. The researchers, who include neurosurgeon James Burgess, biomedical engineer James Antaki, surgical and biomedical engineering professor George Pantalos and doctoral student Jenifer Hayden, first looked at the system as an approach to control bleeding during brain and spinal surgeries on Earth; the controlled fluid pressure can act like pressed gauze to stop bleeding and can be flushed to provide a clear view for the surgeon. The idea was a bit too radical for the medical industry and was not able to secure funding. Looking for a different approach, Antaki lit on NASA: “I realized that in outer space, zero gravity was a bigger problem, so let’s pursue a NASA grant,” he said. In microgravity, there is no way to prevent bodily fluids and tissue from floating away from their owner – and even contaminating an entire spacecraft. Some sort of containment system is needed. A liquid filled system can provide advantages in removing undesirable fluids, since in the absence of gravity, surface tension tends to keep liquids clustered against the skin unless mechanically removed. The system is slated to undergo parabolic flight testing in October, including surgical procedures on a pig’s heart under microgravity conditions. So far, NASA has not funded the project but has expressed interest and is providing parabolic flight access.